Summary of President William Taft for Kids: "Big Lub"
Summary: William Taft (1857-1930), nicknamed the "Big Lub", was the 27th American President and served in office from 1909-1913. The Presidency of William Taft spanned the period in United States history that encompasses the events of the Maturation Era or the Gilded Age. President William Taft represented the Republican political party which influenced the domestic and foreign policies of his presidency including Taft's Dollar Diplomacy. 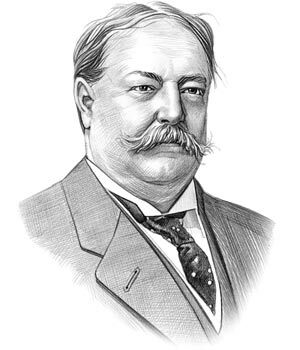 The major accomplishments and the famous, main events that occurred during the time that William Taft was president included the Antitrust Policy, the Ballinger-Pinchot affair and the 1909 Payne-Aldrich Tariff Act. The Angel Island Immigration Station opened on January 21, 1910 in San Francisco Bay, California and the world was shocked by the Sinking of the Titanic in 1912. William Taft died of a heart attack on March 8, 1930, aged 72. The next president was Woodrow Wilson. The summary and fact file of William Taft provides bitesize facts about his life. The Nickname of William Taft: "Big Lub"
The nickname of President William Taft provides an insight into how the man was viewed by the American public during his presidency. The meaning of the nickname "Big Lub" together with "Big Will" and "Big Chief" are a reference to his large size. His wife, Helen Taft, gave him the nickname of the "Sleeping Beauty" due to his habit of falling asleep on car rides. The character traits of President William Taft can be described as outgoing, genial, gregarious, amiable and diligent, with a strong sense of responsibility. It has been speculated that the Myers-Briggs personality type for William Taft is an ESFJ (Extraversion, Sensing, Feeling, Judgment). An outgoing, sociable, expressive character and a nurturer of established social institutions. William Taft Personality type: Friendly, gregarous, cooperative, observant and informative. Summary of the Progressive Movement: The Progressive Movement and Progressive Reforms continued during the presidency of William Taft addressing political and social reforms relating to working conditions, child labor, education and female suffrage. Bribery and corruption, the political machines and unfair business practices were also attacked. Summary of the Taft's Dollar Diplomacy: The foreign policy of the administration was known as Taft's Dollar Diplomacy (1909 to 1913) and was designed to increase the economic power of the US, promoting trade in Latin America, the Caribbean, West Africa and East Asia. It also aimed at preventing foreign powers from increasing their financial foothold in key markets. William Taft's dollar diplomacy failed to counteract economic and political instability and resulted in animosity against the United States. Summary of the Payne-Aldrich Tariff Act of 1909: The Payne-Aldrich Tariff Act of 1909 was designed to lower tariff rates but but also enacted a corporation tax. The law alienated President William Taft from the Progressives and Conservative Republicans who criticized the president for being weak and indecisive. Summary of the Ballinger-Pinchot Scandal: The Ballinger-Pinchot Scandal exploded in November 1909 when conservationist Gifford Pinchot revealed that Richard Ballinger, the Secretary of the Interior, had made nearly 1 million acres of Alaskan public forests and coal fields open to private development. Summary of the US and the Mexican Revolution: The US and the Mexican Revolution (1910 - 1920) saw two episodes of intervention and involvement by the US in the Mexican Revolution led by revolutionaries including Francisco "Pancho" Villa and Emiliano Zapata Salazar. Summary of the Mann-Elkins Act of 1910: The Mann-Elkins Act of 1910 set railroad rates and regulate the telecommunications industry. The new law extended the authority of the Interstate Commerce Commission (ICC) to cover telephones, telegraphs and radio companies. Summary of the Postal Savings System: The Postal Savings System was established by the Postal Savings Depository Act of 1910 introducing a system whereby certificates or savings stamps were issued to depositors as proof of their deposit and could be exchanged in amounts of $20 or more for postal savings bonds. Summary of the Angel Island Immigration Station: The Angel Island Immigration Station was opened on January 21, 1910 in San Francisco Bay, California as a detention center for immigrants from China, Japan and Asia. Summary of Alcatraz Prison: The new Alcatraz Prison construction was completed in 1912 as a high security penitentiary to house murderers, gangsters and bank robbers. Summary of the Sinking of the Titanic: The Sinking of the Titanic occurred on 15 April 1912 when the British passenger ship struck an iceberg and sank into the North Atlantic Ocean. A total of 1523 people died, there were only 705 survivors on the "unsinkable" ship. The article on the accomplishments of William Taft provides an overview and summary of some of the most important events during his presidency. The following William Taft video will give you additional important facts about the events of his administration.